Now you can also preorder an ebook of The Peyti Crisis, which marks Flint’s return to the series after the events of Blowback. 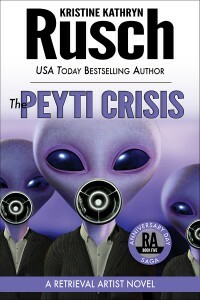 You can get The Peyti Crisis on Amazon, Kobo, and iTunes right now. I suspect the audio version preorder will appear next month. To understand what happens in The Peyti Crisis and the remaining three books, you’ll need to read A Murder of Clones and Search & Recovery. Right now, those three ebook sites and Audible are the only places to get the preorders. On their official release dates, the books will be available in trade paper, ebook, and audio on many different retailers. In fact, if you talk to your favorite brick-and-mortar bookstore while holiday shopping, you might be able to convince them to order paper copies in time for the release of A Murder of Clones on January 13, 2015. If you haven’t started the Anniversary Day books in the Retrieval Artist universe, now’s the time. The reissues of Anniversary Day and Blowback are both available with a letter from the author in each. If you want Retrieval Artist updates without visiting this website, sign up for the Retrieval Artist newsletter. And the next announcement, in January 2015, will be of A Murder of Clones’ publication! Woot!